While I love teaching my Greek Cookery Classes on how to make delicious and home-cooked Greek food, using quality ingredients that are easily found in London, I still have one question from those come in and cook and eat with us at the classes. Where in London do you eat good Greek food apart from Greek Cookery Class? Please note that all food is homecooked, even the bread, no prefab and no ready made meals! On Saturday 5th June 2010 from 6:30 to 10pm you can come and eat delicious home-cooked Greek food made by me, at an informal and friendly setting surrounded by other Greek food lovers. You bring your own drink and you won’t have to wash the dishes afterwards. Veggie option available, any other dietary needs, please request on booking as I try my best to cater for all. As usual you can book for more people than yourself. You’ll be sitting around large tables and able to enjoy the company of others if you only book one slot. Price: £35 (includes all food and service charge) Advanced payment only! First come first served, so book early to avoid disappointment. Location: between Liverpool Street and Old Street stations, exact address disclosed upon payment. Looking forward to having you eat at the Greekfoodlovers’ Supper Club 5th June 2010. 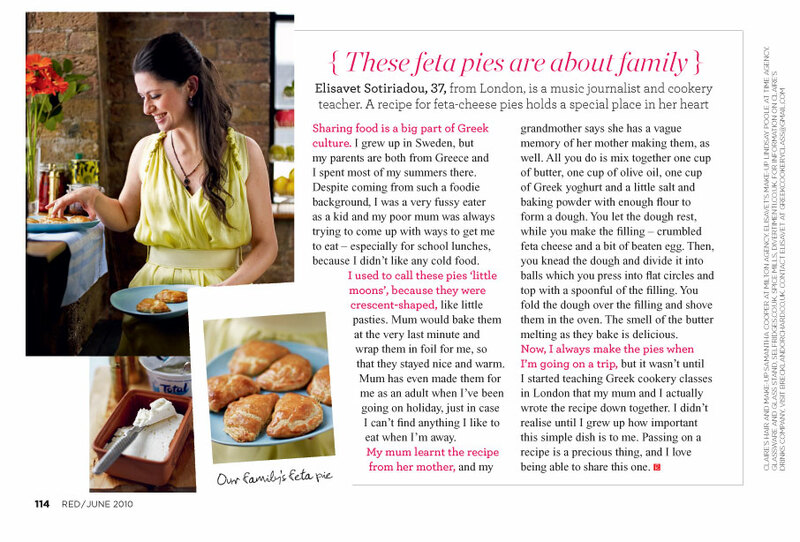 This entry was posted on May 15, 2010 at 2:39 pm and is filed under Foodepedia, Greek Cookery Class, Greek food, Greek Supper Club, Red Magazine, Supper Club, Supper Club London. You can follow any responses to this entry through the RSS 2.0 feed. You can leave a response, or trackback from your own site.